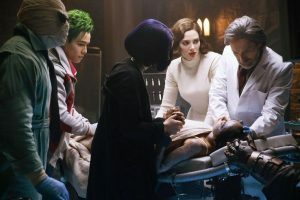 The key premise and hook for this week’s episode of Titans was referenced just by its title – “Doom Patrol”. Just the mention of this several months ago was enough to send the fanboys and fangirls wild with delirium. To think that we all now live in an age where such an offbeat comic book property would not only get its own live action representation, but also that this episode would be used as a back door pilot to their own series, coming in 2019! 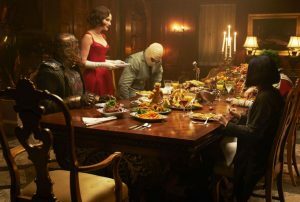 My own personal fear regarding this integration of the Doom Patrol into the now established world and tone of Titans, was that such a fantastical, offbeat and at times whimsical set of characters would not fit in so effortlessly, that they would serve to almost remove viewers from the status quo and not blend into the world that has been created. Would it end up like trying to be like shoehorning in a B’Wanna Beast cameo into The Dark Knight Rises?…. Of course not! The episode was masterfully done, written by comic book royalty in the form of the ubiquitous Geoff Johns. His excellent screenplay served two masters in not only folding the Doom Patrol into this world, but giving Beast Boy some long overdue screen time and also giving his backstory and power set an explanation, which is where the episode starts by way of a flashback to two years ago in the Congo, where we find a bed-ridden Gar Logan, dying from an unmentioned condition (sakutia for all you comic book reference junkies out there). A mysterious figure in a hazmat suit injects him with a green liquid, where we then see him start to scream in pain whilst his skin takes on a green hue…… Whenever an origin of a much loved character is depicted in live action it is always great to see, and especially in this instance where it’s a character that hasn’t been done before. Ryan Potter gets to display his acting range in this sequence and throughout the episode, showing chops for both the comedic and the dramatic. This augers well for the path of his character as the season unfurls. It is through Garfield that we get our much anticipated introduction to the core member of the Doom Patrol. As he and Rachel are united on the run, he brings them to his home, located within the vast Caulder manor. Caulder? of course, this is Niles “Chief” Caulder, played by Bruno Bichir with a wonderful mix of fundamental warmth and an underlying measure of something slightly sinister. 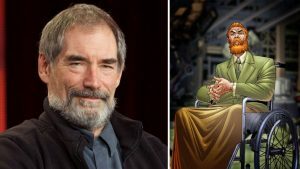 Unfortunately for Bichir, this is the last time we will see his interpretation of the character, as the role has been recast for the Doom Patrol series in the form of Timothy Dalton. As much as I enjoyed Bichir, I am overjoyed at the casting of Dalton, who is still to this day my favourite 007, and a wonderful screen presence in everything he graces with his talent. From their arrival at the Caulder mansion, we are then treated to the onscreen arrival of a wonderful arrival of eclectic, dark and visually stunning characters, who form Garfield’s pseudo-family. Cliff Steele aka Robotman is wonderfully realised, seemingly lifted straight from the comic book pages visually. As with all the new characters in this episode, only tidbits relating to their backstories are given to us as their own series will no doubt flesh things out in minute detail. We get a true sense of the tragedy of the character as we see photographs relating to his former glory as a racing driver, pre the accident that destroyed his body and forced Caulder to put his brain into the robot body to survive. There is a great sadness behind those red eyes, and a sense of regret. We are also introduced to Negative Man, aka Larry Trainor. 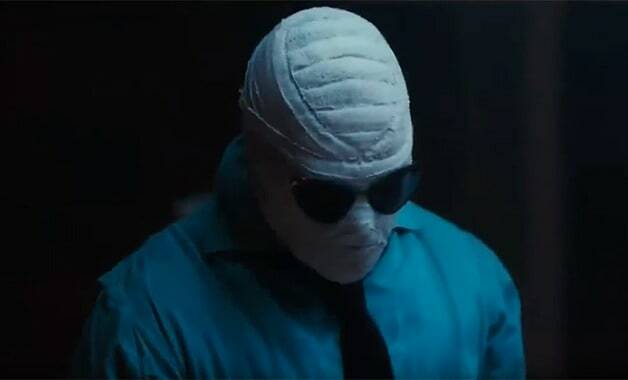 Swathed from head to toe in bandages, looking like the Universal version of the Invisible Man, we are only given brief bits and pieces about his true nature. For non-comic book readers, I am not going to go into any spoiler-filled details about the character, only to say that when we see him unleashed, it will be quite something to behold! On a side note, the character’s taste for AC/DC and Def Leppard classics makes him a winner in my book! Our other introduction is to Rita Farr, better known as Elasti-Woman. Again, only certain details are given out to the viewers about the character, but suffice to say this is one complex, tortured soul. Her grotesque physical form when not in her conventional state was something akin to Cronenberg at his very best and is again something new for this genre of television. I simply cannot wait for the Doom Patrol series to come, it will be a quantum leap from any previous comic book tv show, certainly something very unique and must see! All the questions raised about the characters will be answered and then some, it is going to be something very special indeed. Geoff Johns hit the script out of the park this week, as he tends to do with pretty much everything he writes, meshing together two totally different groups into an episode that struck a perfect blend of humour, darkness and a healthy dose of pathos too. Each week the show is scaling new heights and making it must see, appointment viewing. Roll on episode 5….